It's *kind of* cold here in Texas which means it's soup season y'all. It's also new baby season around here. I can name at least 10 of my friends who have had babies in the past 6 weeks which means I've been making a lot of meals for new parents. I love taking soup for baby meals because I can make it healthy and hearty. I made this chicken noodle soup this week, a double batch, one for me and one for a baby meal, and I never want it to end. 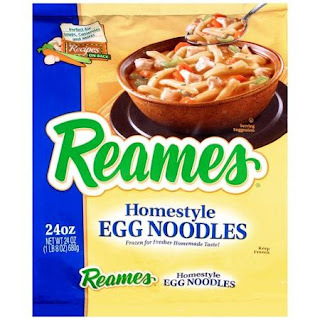 I used Reames noodles that my grandma makes at Thanksgiving dinner and I'm kicking myself for not using them in a soup sooner. They are delicious and to die for. I made this soup up as I went and boy is it good. 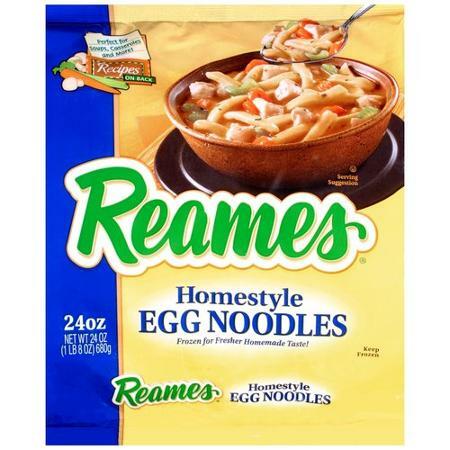 Reames Noodles can be found in your freezer section, by the potatoes and frozen veggies at my store. Here is a picture for reference. 1. Pour 2 cups chicken broth, onions, carrots, and celery into a pot and bring to a boil. Turn down the heat and let simmer for 10 minutes until the veggies are soft. 2. Add additional 4 cups of broth, chicken, and noodles and simmer another 10 minutes or until noodles are tender. 3. Season with parsley, salt, and pepper. Mmm! Looks so yummy! Soup is perfect this time of year!